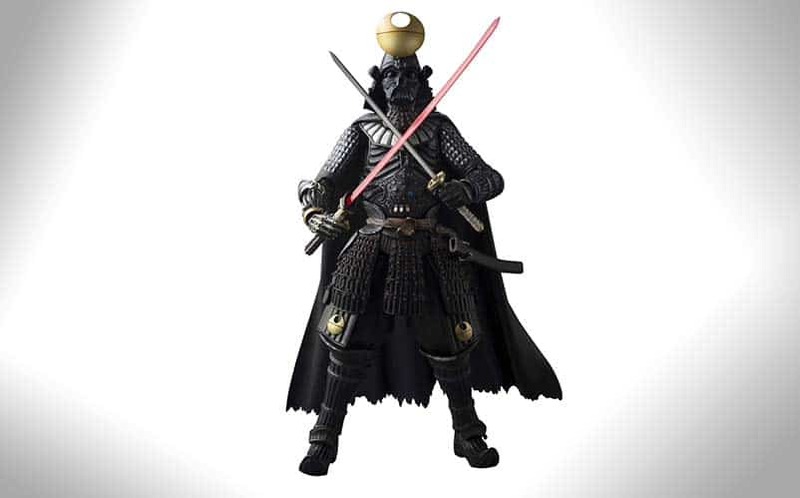 Samurai Darth Vader Figure | Nerd Much? Re-imagining Star Wars characters isn’t anything new, and we’ve seen so many different iterations of Luke, Leia, and Chewbacca that we’ve lost count regarding just how many we’ve seen. But, occasionally, we’ll come across a new version of an iconic character that’s worth talking about (and, in this case, sharing with our readers). Introducing the Star Wars Bandai Samurai Taisho Darth Vader Figure, which takes everything we know about Vader and applies his likeness to a samurai. Artist Takeya Takayuki is the man behind this highly stylized figure, which pays homage to both Star Wars and the Japan aesthetic. The figure is able to be maneuvered and posed as you please, thanks to its hybrid materials. The Darth Vader samurai figure comes with a katana, large and small blasters, a lightsaber, and three interchangeable hands. It sits at 7″ tall, and it’s available via Amazon right now. There are also other similarly designed figures available, including a Storm Trooper and Boba Fett. But our pick of the litter? Samurai Darth Vader. Buy the Samurai Darth Vader here.